Directional Double Kicks or Shaped decks, are very popular among modern transition and park shredders and OG skaters the world over. These boards differ from traditional popcicle shapes, as they have unique noses, tails, carves and rails. Shaped decks tend to be on the wider end of the scale, as they are commonly used in vert ramps, pools, bowls and transition parks. The variations in shape, offer the rider unique flair and board feel, so they can get that indy air, fully steezed out. The directional shapes are also very popular with skaters simply looking to slash their way to work or the pub, on a wide comfortable shape with the OG vibe. 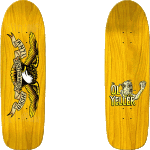 Basement Skate stock Shaped Decks from skateboarding's elite Black Label, Heroin, Assault, Madrid, Prime, Polar, Santa Cruz, Shipyard, surprise, Tired, Welcome and Powell Peralta.